Get a free estimate and quickly get your project rolling. To get started just complete our estimate form with some basic information. A representative will call you shortly. 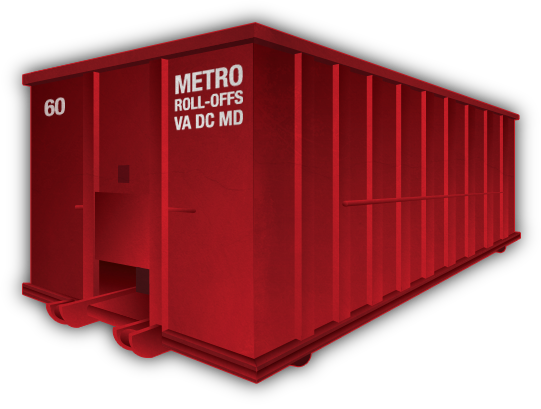 With over 200 roll off containers ranging in size from 10 cubic yards to 40 cubic yards, Metro Roll Offs has got you covered. View the details of our various dumpster sizes below. Length: 12 ft. 9 in. Height: Inside 3 ft. 6 in. Outside 4 ft. 3 in. Height: Inside 5 ft. 2 in. Outside 7 ft. 10 in. We service the entire Northern VA Metropolitan Area as well as Maryland and Washington D.C. Our prices include pickup and drop off fees so there are no suprises or hidden costs. Do you have a roll off container of ours that needs to be emptied or picked up? We can help with that too! Whether you are a contractor, government agency, commercial property or a homeowner we proudly serve all types of clients. And with exceptional customer service, tradition and values you can count on Metro Roll Offs to deliver.